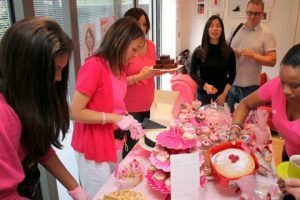 On Friday 23rd October we had our third wear it pink fundraising bake off for Breast Cancer Now. This year we were determined to stick to the pledge that the four of us had made during the summer, to make each bake off bigger and better year after year. To raise more funds, we also invited our children’s school to take part in their own event. 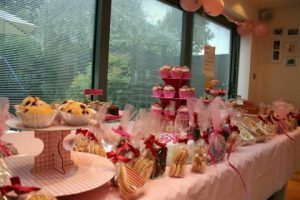 The children baked cakes which were sold at break time to raise money and the staff held an after school tea party. Also this year our local pre-school gave us a surprise, but very welcome donation. Our aim was to beat last year’s grand total of £1,205. Did we do it? You’ll have to wait and see. With invitations out, posters in windows, and a Just Giving page set up for those who couldn’t attend. The countdown was on to create the biggest and best bake off ever. After an extremely late night with our heads in the oven, countless texts, an estimated two bags of self-raising flower, 4lbs of butter and three dozen eggs later, our big day had finally arrived. By this stage the kitchen was an explosion of pink with balloons, bunting, cake boxes (donated by our very generous local supermarket) and pink flowers everywhere. 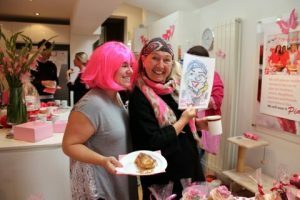 We donned our pink t-shirts and waited in anticipation for our friends, family and neighbours to arrive and help us raise money for this more than worthy cause. 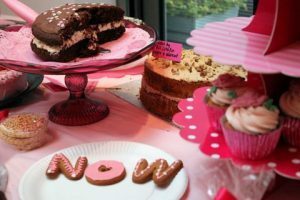 As the locals arrived they brought home made goodies in their abundance, which were labelled up by Angie-may and displayed on our beautiful and now over flowing cake table. Rachael was at the ready with tea, coffee and cake for our first arrivals. Bronwen was busy signing people up for our fabulous raffle, of which prizes were generously donated by local shops and businesses in High Barnet. 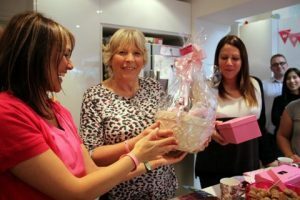 These included gifts such as cookery books, beautiful handmade bags, fitness classes and reflexology treatments. Meanwhile Sophie was expertly serving and boxing up cakes, which were being bought by our ever so generous customers. We had great success with our sweepstake (the prize being a mixing bowl full of baking goods) and also our guess the amount of corks in the mixing bowl. As people mingled throughout the morning they gave donations to have their caricatures sketched by our local caricaturist Simon Ellinas who kindly offered his services for free. It really was a fabulous morning, as well as raising money everyone involved had really a great time. 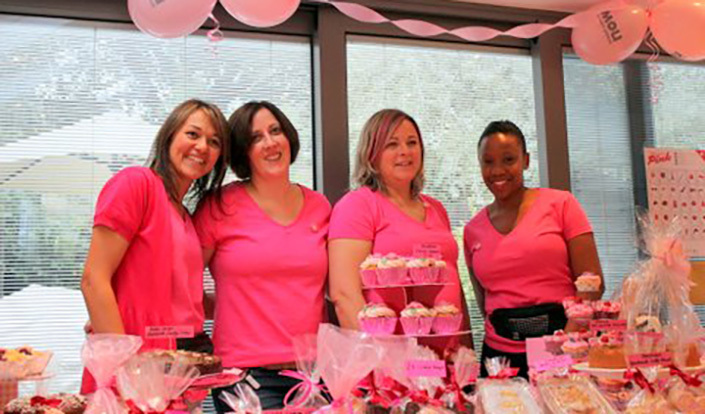 After weeks of planning, hours of baking and a morning of great fun with some successful fundraising thrown in, our 2015 wear it pink bake off finally came to an end. The tea cups were empty, the cakes were all sold and the question on all of our minds was, had we beaten last year’s total? It took us a while to count but we’re really proud to say we did it! We raised a whopping grand total of £1,877.03! We would really like to extend our thanks to all the local businesses who donate gifts year after year to help us out. Everyone who made a donation at the event or through Just Giving. Also this year to our local schools – Foulds school and Foulds pre-school, as well as the school where Sophie works – The Holmewood School London, who all worked very hard to help us make a difference. It took some organising and a lot of hard work but the four of us will always be proud to wear it pink for Breast Cancer Now. As for next year, well the pledge was to go bigger and better year after year!